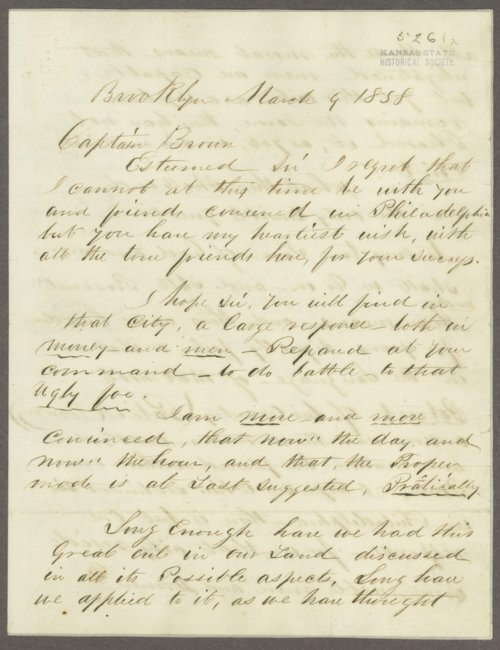 A letter from James N. Gloucester, Brooklyn, New York, to John Brown. Gloucester, the son of a former slave, sends his regrets that he cannot attend a meeting in Philadelphia and hopes Brown finds money and support for his cause to abolish slavery. Also, he writes that black men north and south of the Mason and Dixon line, whatever their wealth and position, are not free. Gloucester asks Brown to read the letter to the assemblage if he thinks it will help. A typed transcription is also included.